...so, it's time for more work on the turntable! Everything fits together quite neatly now, which is quite pleasing. The great news is that the turntable running rails appear to be placed very accurately - or at least as close as I can judge. The jig I built seems to have done its job! That means no fiddly adjustments should be necessary. I can now get on with the well wall, which will be attached to the baseboard, rather than the turntable well itself. Painting will have to wait a while, as there will be lots of concrete modelled in this part of the layout. I need it all to match, so will paint it all together later on. Elsewhere, I have finally glued the platform to the goods/transit shed. Here is a photo showing it in place - along with another Christmas present. This one arrived on Christmas Eve. The Peckett really is a fabulous model. Not sure that it would really be appropriate here, but then the Tramway is desperate for motive power at the moment. I see ideas are already circulating on how to convert one to P4. The well wall should be next, followed by finishing the track laying, I hope. I won't be making the turntable fully operational for a while yet. I will just use it for track alignment purposes for now - and then put it carefully in store to avoid damaging it whilst I get on with some of the scenic work. All looking good Richard. Will be interested in seeing how you P4 the Peckett when you get to that stage. Would make a change from from my RSH's. Not sure when I will get around to doing the Peckett just yet - likely mid-year at the earliest. It may even rest subtly in the roundhouse for a while, should I ever get to exhibit the layout. No one will notice that the wheels are set to narrow gauge in there I can test my track more than adequately with just the Sentinel steamer and the Class 20 for the time being. Your suggestion of variety raises an interesting issue that I have been pondering recently. My original thinking was to have a very wide variety of locos and railcars, but would a real railway have existed like that? Ignoring second-hand and opportunistic purchases, I reckon most very small concerns would probably just stick with one supplier for quite a long time, unless there was good reason for change. The issue is certainly making me rethink my plans just a tiny bit. Armchair Modeller wrote: My original thinking was to have a very wide variety of locos and railcars, but would a real railway have existed like that? Ignoring second-hand and opportunistic purchases, I reckon most very small concerns would probably just stick with one supplier for quite a long time, unless there was good reason for change. That does have great modelling potential - not just for the sheer variety of stock, but the modelling of neglect and dereliction can make a layout incredibly atmospheric, if done well. The atmosphere I want to portray on my little tramway isn't really like that though. I visualise a scenario where there is sufficient traffic to keep the stock in reasonably good condition and refurbished as necessary, with occasional new stuff as need and opportunity dictate. Maybe a bit like the Donegal after Forbes' death, for example. Colonel Stephens would probably have been hung, drawn and quartered if he had dared to come anywhere near Neversay. Mind you, the quality of my modelling may in itself lead to a Colonel Stephens situation, with (and I quote from above) 'a growing line of locos in various states of disintegration'. We shall have to wait and see. It was not only the smaller concerns that had locos waiting for repair. Prior to the opening in 1912 of the carriage Works at lancing the LBSC was very short of space at their works located just outside Brighton Station. It was common practice to store locos waiting for repair or scrapping on sidings at Horsted Keynes station. A picture dated 1906 shows around 30 or so stored at this location including one with the boiler removed. A later picture dated 1910 shows engines in the same location stored with the caption stating that they were surplus to requirements following the electrification of the South London line in 1909. Another example of stored engines in rural locations occurred during WW 2 when the Southern placed small stocks of elderly locos at various locations around the system to be called upon in the event of bomb damage at depots. I suspect Noel's point was that stock was just left abandoned in the Col. Stephens empire, with little or no hope of repair. This is even more amazing in remote places abroad where the atmosphere can preserve things for very long periods of time. 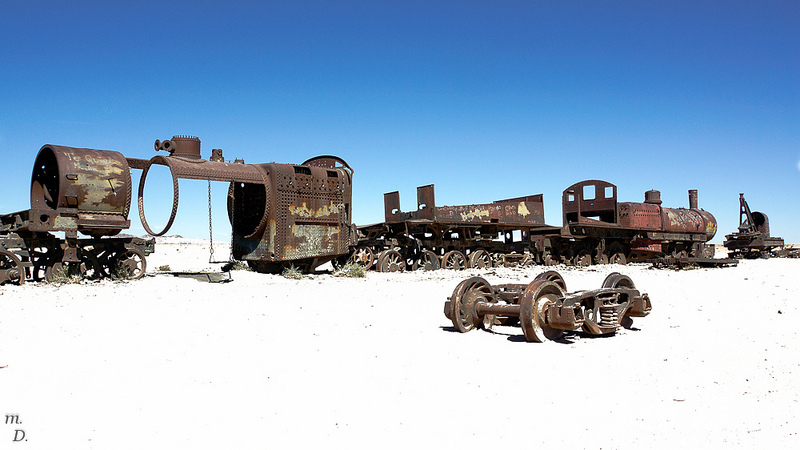 I remember touring old nitrate workings in Northern Chile, for example - and there is the famous loco graveyard at Uyuni in Bolivia. More remarkable are the ones abandoned, then brought back to life, like Jane on the Wantage Tramway. On a much larger scale, the Eritrean Railway, where climate kept much just as it had been abandoned and a desire for a symbol of national unity saw a whole railway system brought back from the dead. What struck me about the Eritrean example was just how easy it can be to keep steam locos operating indefinitely. The workshops there had patterns for making more or less everything the railway needed. There are plenty of other examples where ingenuity kept a railway running in the face of adversity. Stock didn't always have to be pushed into a siding and just left to rot away. This is the first turntable I have ever built or installed on a layout, so please forgive my slow progress. All sorts of issues are occurring to me as I go along - though thankfully, none have resulted in problems. Two issues occupied my mind over the last few days - whether or not the well should be made removable and if I needed some kind of locking on the table when it is aligned with an exit track. On the removeability issue, I decided to abandon any such idea. The well will be semi- permanently fixed to the baseboard. I reasoned that the need for removal and adjustment would be remote - and there would probably be other ways of dealing with them. A fixed well also allows better integration with the surrounding scenery. So, I returned to my original idea of attaching the well wall to the well base. The wall was made using three layers of plasticard laminated together around the existing plasticard edges of the well base. I then attached the base to the baseboard using screws. Still removable if, for example, I wanted to use the turntable on another layout - but in reality, this is unlikely to happen. For the positive location of the table at each exit track, I looked through a number of ideas in magazines and on the Web. I wanted something relatively non-technical. Apart from using DCC for train control, I really want this layout to be as simple as possible. I originally thought of using rods locating in tubes on a disc attached to the turntable shaft under the baseboard. Unfortunately, I have left myself little room below the well, especially after the slip ring and a means of rotating the turntable are taken into consideration. Thoughts moved on to something above the baseboard instead. I ended up thinking of using something similar to what the real turntable would have used - but in reverse. I chose to put the tubes directly below the the turntable deck, to keep things simple. I took the view that in practice, the locking mechanism will not be visible anyway, so it doesn't matter. Here is one end of the deck, with the tube in position. After I had soldered the tubes in position I made a crude test rig to make sure that both tubes were in exactly the same place relative to the running rails. Everything was fine! Now, I have to work out how to fit retractable pins under the rails of each exit track. The plan is to use wire-in-tube for the operating mechanism. I am too late for the main running line, as the trackbed and sleepers are already in place. I should be able to lock the deck from the other end in this alignment though - under the track leading to the dockside. So now, the well is in place and ready for track and scenery to be placed around it. I am definitely going ahead with the roundhouse idea I mooted weeks ago. It seems like a no-brainer really. It will fill a vacant space very nicely. It will provide a point of great interest to model and to look at. It will also add a bit of extra operational variety. After studying loads of photographs, I think I have a good idea of what it will all look like too - but more of that another time. So that's it for this year - though only fractionally over 5 month's work on Neversay Mk2. I must say I am very pleased with the project so far, even if a few aspects (like the turntable) are taking far longer than I could have imagined. Research has taken a lot of my time too - mostly now complete. Once the turntable locking rods are in position, I should quickly be able to finish the track laying and get the track on board two operational. Then, it will mainly be scenery and stock to do. For the scenery, I am very happy in my mind as to how it will all look, especially now that I have definitely decided to include the roundhouse. Neversay probably won't look much like anything you might be expecting, even though I have given a few clues away already. More of that in good time! What is not to like about a Roundhouse? They were very common out here (New South Wales). Attached is a scan of a slide of Port Waratah - which lasted in steam use until 21st of December 1972. The end of regular steam workings on the Government system. The other slide shows 5069 leaving "the port" on another "non air" (i.e loose coupled) working. I think this slide was taken in 1972 and shows the last day of workings. In the background is the depot and the coal stage used to replenish the loco coal. Apologies for the foreign diversion, I hope it is of interest. To my eyes, whilst there is a colonial appearance to things it is also in many ways an essentially British railway. All gone now of course. Many thanks for the photos and comments Craig. Information about non-UK railways is always welcome here. I do appreciate the merits of far-flung railways. Historically at least, they sometimes make UK railways seem rather bland. If all the exit tracks are like the incoming one, then probably the answer is to fit the operating device to the underside of the Plywood sub base. It will probably be necessary to cut a hole in the baseboard top as well. You will of course need to find a way of sliding the bolt out which could be a simple wire in tube but a solenoid could be used if you can find one small enough. Craig Warton wrote: What is not to like about a Roundhouse? It will certainly look good. The LBSC had a semi roundhouse - just under 3/4 of a circle, at Horsham with the design not very different to the picture that Craig has posted, apart from brick built end walls and probably a slate roof. Armchair Modeller wrote: I should quickly be able to finish the track laying and get the track on board two operational. Then, it will mainly be scenery and stock to do. Which Scaleforum shall we put you down for? Terry Bendall wrote: The LBSC had a semi roundhouse - just under 3/4 of a circle, at Horsham with the design not very different to the picture that Craig has posted, apart from brick built end walls and probably a slate roof. Guildford [LSWR] and St. Blazey [GWR, ex-Cornwall Railway] both had semi-roundhouses. Terry Bendall wrote: If all the exit tracks are like the incoming one, then probably the answer is to fit the operating device to the underside of the Plywood sub base. It will probably be necessary to cut a hole in the baseboard top as well. You will of course need to find a way of sliding the bolt out which could be a simple wire in tube but a solenoid could be used if you can find one small enough. Wire in tube fits the "Primitive Cool" label, I think. I shall be testing my idea out on one of the roundhouse roads first. The tubes will be more or less level with the top of the plywood sub-base (i.e. recessed in the bottom of the MDF layer) - but the sub-base and the trackwork in the loco shed area will be different to the incoming track, so the end result will be slightly different. Overall, it ought to be reasonably straightforward. I will have a few inspection pits to avoid (pitfalls? ) and the exit track to the imaginary quayside is a bit short on space, so I have a few things to think about. Terry Bendall wrote: Which Scaleforum shall we put you down for? Last edited by Armchair Modeller on Sun Jan 01, 2017 12:35 pm, edited 1 time in total. I may as well admit that Cuzco (Peru) was a relatively unsubtle hint. As mentioned earlier, I need something that might have been built in a hurry during WW1. This one ticks a lot of boxes for me, though it will be modified to some extent. I have actually been there, but my photos are lost somewhere in a huge pile of pre-digital photo prints and negatives. The inspiration for the turntable well comes from the same place. I hope you will all agree that it is very atmospheric - and with a few very minor adjustments it fits the location perfectly. Far more appropriate for my tramway than a main-line style of building. None of the original images are mine. I found them on the Internet some time last year and regrettably did not make a note of the sources. I will happily acknowledge copyright etc. if requested. The versions shown here are my own edited and slightly artistic modifications. .......but not the rest of the scenery - not just yet, anyway! The roundhouse will certainly be intriguing and a challenge if you are retaining the skeletal basis of it. Guess we'll have to wait and see. For the roundhouse, I am thinking of doing something reasonably close to the original, but that could change slightly as I put things together. That should be OK but I think Scaleforum will be organised by someone else then. I shall be 87 in 2033 and my forward planning does not go that far. Moving back to serious thoughts - and even a bit of modelling! I have had the roundhouse idea (based on Cuzco) in mind for a while - more or less since I chose the design for the turntable well. I couldn't resist a minor tweak though - rotating the turntable round a little so the drain was slightly more parallel with the layout frontage. This enables the drain to fit much better with the tracks radiating from the turntable. The locking tubes around the circumference of the turntable well are now being installed. I did the first one as a trial, choosing the siding just behind the man running tracks. Firstly, I soldered some 1.5mm I.D. tubing to a piece of copperclad sheet. Then, I cut a piece of MDF as packing underneath. I glued the MDF and the copperclad to the baseboard using epoxy. I slid a bit of 1.5mm rod through the tubing and into the tubing already soldered on the underside of the turntable deck. The packing piece is deliberately a slightly loose fit, so the copperclad can find its natural level. I used 24 hour epoxy, as that was all I had at the time. I can only do one tube at a time with this glue. It will take a few days to get them all done, as I daren't remove the rod until the epoxy is fully set. No rush though, as there is plenty else to do. This shows the first alignment tube in place ready for testing. After waiting 24 hours, I tested the alignment of the locking tube with the tubes at each end of the underside of the turntable deck. Both were in excellent alignment, which is very encouraging. Next, I cut a slot in the baseboard top behind the locking tube. The rod sitting inside the tube will be L shaped to go down below baseboard level. The slot is for the vertical part of the rod to slide in. Here is a picture with the slot cut. I had also added a few bits of scrap plywood by this time to build up the ground level around the locking tube. Eventually, the slot and the locking tube will be covered by the track sub-base and the track, so will only be accessible from underneath. The second locking tube is currently setting. This is the one under the track leading to the quayside. I am now getting ready to install the track over the first locking tube. This will run alongside the drain and behind the goods/transit shed. The rails will be recessed in 'concrete'. Here is a shot showing the trackbed with the Templot track plan stuck in place. This piece of track is experimental, with a piece of foamboard and then a layer of MDF under the track plan. All will be waterproofed before I get any water near it. The foamboard was glued on with fast drying wood glue and weighed down until the glue dried. The MDF was glued down with Unibond Repair Extreme Power Glue, as was the track plan. I was going to use contact adhesive, but my tin is going off and barely useable now. Here is a photo with the track plan stuck down and the shed placed loosely in position. I am still scratching my head wondering what to model underneath the shed. Being in permanent shade, I can't imagine much growing under there. I am not even sure whether it should be level ground or dip in the middle, as a kind of drain. Any ideas are welcome! I ended up busier than expected over the last week or so, so nothing like as much got done on Neversay as I had anticipated. Nevertheless, I am making gentle progress. The locking tubes for the turntable are now all in place around the turntable well. I had a couple of close calls on this with the adhesive getting into places it wasn't supposed to. One of the benefits of using 24hr epoxy is that it takes time to go off though, so I was able to make reasonably dignified recoveries Here is a photo showing the 10 tubes in position. Clockwise from the left, they are the quay line, a short siding, 5 inside the roundhouse, 2 in the rectangular shed at the side of the roundhouse, transit shed siding and main line. The tubes in the roundhouse area are shorter than the rest to allow sufficient room for maintenance pits on the shed roads. I will have to cut the remaining operating slots through the baseboard top and fabricate the locking mechanisms. Then I can fill in the area around the turntable and lay track. I have also laid part of the track at the back of the transit shed. This will be recessed in a concrete roadway alongside the shed, so I have used code 75 rail soldered direct to copper clad sleepers. I cut these sleepers 1" long - more or less the absolute minimum practicable length. The remainder from the shed to the turntable will be bullhead using Masokits etched chairs and code 60 rail, as per normal. By luck, this combination of the two techniques gives track of equal height all the way through. I laid this track to make sure that the transit shed would fit OK between the tracks - which it does. Seriously, I have been busy getting through some New Year resolutions, though the last three weeks have been punctuated by a bad cold and a vomiting bug at more or less the same time. One of the New Year resolutions was to catch up on a lot of reading. This is neatly dovetailing into more modelling through reading Iain Rice's new book about cameo modelling. I also now have a 6 month plan of what needs to be done for Neversay. The layout will slowly progress, but I need to concentrate more on stock. The article about project creep in the last but one Scalefour Journal made me think a bit - the layout is fine, but ideas for stock have got rather out of control. I need to focus more on what the tramway needs, rather than trying to build or convert anything and everything I can. As far as scenery is concerned, the roundhouse, tunnel mouth and cliffs at the back of the layout are a bigger priority than the dye works at the moment. The roundhouse alone will involve a lot of modelling! I am hoping to make progress with the Ruston shunter and the Ford railbus pair over the next week or two. Some new ultra-compact gears arrived this morning, by coincidence, so I now have all I need to do the chassis for these. The customs house is on the left and the London & Paris Hotel on the right. The world famous Neversay Dye works is just off the picture to the right. The central baseboard joint will be immediately to the left of the customs house. Lots of boring stuff happened over the last few weeks – so there was little point in doing updates. Wiring the layout and adding inside half-chairs to the second board have been keeping me busy – along with general thoughts on how best to proceed with stock construction and various features on the layout. Reading through Iain Rice’s book on cameo layouts made me think in new ways about several things. One idea that struck a chord was having the ability to switch out sections of the track for fault finding purposes on a DCC layout. I had big problems with one of the baseboards on Neversay Version 1 with a particularly obstinate short that almost completely refused to be found. I ended up disconnecting many wires before I finally found it – a sliver of nickel silver rail that had slipped into an insulation gap near a crossing. Avoiding the risk of having to go through all that again seemed like a really good move. I had already finished the wiring on the first scenic board on Neversay V2. Nevertheless, I took the Rice idea to heart and re-jigged the wiring to incorporate four on/off switches. These would not be used in normal operation, though they could I suppose be used should I wish to run the layout in DC mode. The other issue that jumped out of the book was the question of where I should operate the layout from. I had rather taken it for granted, without even thinking about it, that I would always operate the layout from behind the backscene. It suddenly seemed a shame not to be able to operate the layout from the front, when running it at home. That way, I would get by far the best view – just like spectators at an exhibition. Conversely, should some crazy exhibition manager ever invite me to a show , then operating the layout from the back makes far more sense. This is because of the need for the operator to move from one end of the layout to the other to operate various “features” and get a close view of the action when uncoupling, changing cassettes etc. Empowered by this new inspiration, I decided to rethink how I would control various things. First in line for defrocking was the method of operating the turnouts. I had installed slide switches at the back of baseboard one to operate the two single blade turnouts. I had never been completely happy with these for some unknown reason, even though they worked. Maybe the system just wasn’t elegant enough? I decided to replace them with Blue Point activators, which I had installed on Neversay V1. These can easily be fitted to operate from both front and back of the baseboard. It was a no-cost option for me as I have some in stock. They are on a very “soft” setting, so the blades and connections don’t get too hard a time. So, board one is now fully operational again – but with the addition of section switches and Blue Point mechanisms. I think it was worth doing, but it’s one of those things that are probably impossible to evaluate. I still have uncouplers to install. Board two is well on the way as well. I continued my perverse relationship with Masokits etched chairs by adding inside half-chairs to the track already built. I have also wired this up, including more on/off switches for fault finding purposes. I still have the three-way turnout to finish and the sidings radiating from the turntable. I have also wired up the fiddle yard board – not that it involved very much work – just a few inches of plain track! Here’s a photo of some of the track on board two with the half-chairs in good view. The on/off switches are not section switches in the conventional sense. Each baseboard is wired independently from a DCC-style bus. The platform loops, for example, have separate switches on each board which isolate just the length of the loop on that board. On the stock front, I have been messing around trying to establish a few basic standards for future loco and railcar chassis construction. Until recently, I was thinking along the lines of a totipotent design – largely because most of my locos and railcars will be twin axle types. Only lately have I realised that this is a bit futile. Chassis vary enormously, from deep-framed locos where the motor could be set quite low in the chassis, to Sentinels and similar designs which are built very much on wagon principles, with little but air below the underframe. In theory, motive power could consist of anything from standard gauge double Fairlies to donkeys. Rather than spend ages trying to achieve something that is probably impossible, I shall fall back on the unoriginal idea of designing each chassis individually. One of the few things I have learnt from my brief forays into loco construction so far is the need to be able to install and remove wheel sets easily. This is mainly because accurately setting wheels to gauge is devilishly difficult if there is a chassis in the way. I will feel much happier if I can set wheels to gauge and ensure they run without wobbling before I install them in a chassis. Looking at the options available, the High Level hornblocks look the best to me. So, I shall be using these as often as possible – even in instances where rigid, unsprung, uncompensated axles are required. This leads on naturally to chassis jigs, but more of that another time. All this theory is giving me a headache. Armchair Modeller wrote: The other issue that jumped out of the book was the question of where I should operate the layout from. I had rather taken it for granted, without even thinking about it, that I would always operate the layout from behind the backscene. It suddenly seemed a shame not to be able to operate the layout from the front, when running it at home. That way, I would get by far the best view – just like spectators at an exhibition. Conversely, should some crazy exhibition manager ever invite me to a show , then operating the layout from the back makes far more sense. This is because of the need for the operator to move from one end of the layout to the other to operate various “features” and get a close view of the action when uncoupling, changing cassettes etc.